Podcasting is a terrific content medium, and interviewing experts on your show is a particularly effective way to deliver value for your audience. In this extract from James Schramko’s monthly membership training, he shares some of his best podcast interview practices so that you can become more successful. 16:44 – Read the book! James Schramko here, and welcome back to SuperFastBusiness.com. Today’s episode 584 is called How To Enhance Your Podcast Interviews. And in this particular training, this is an extract from the live monthly training from the SuperFastBusiness membership community. And I share this information with you because I want you to get a window into the sort of training that we provide inside the membership. Now of course, the thing that’s different about the membership to the podcast is that you can ask for my help, and I will coach you around the challenges you’re having in your business. I’ll customize it just for you in the private coaching discussion area. So in this training, which is 584, you should go and download the resources. 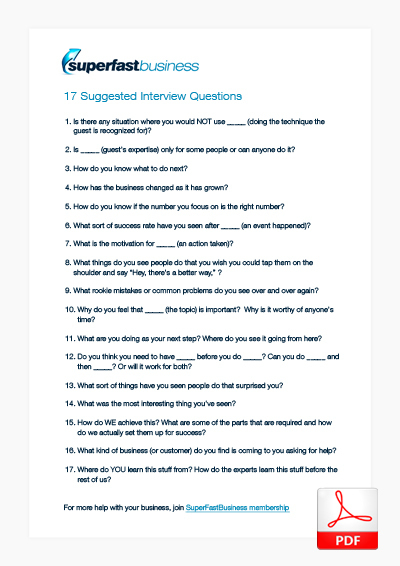 Look for the Podcast Interview Worksheet and the 17 Suggested Interview Questions, which are available as a PDF download right near this episode. So this episode came about because I recognized early on in my online career that I needed to provide audio as a rich medium to reach my customers. The challenge I had was that I didn’t like the sound of my own voice. And I thought I would just start. So I started making some audios and I bumped into a friend of mine in Las Vegas, who’d been listening to some of my audio. And he said ‘James, your voice is boring.’ So not only did I think my voice sucked, a potential prospect or customer also thought it sucked. But I didn’t let that deter me. And as we’re at this stage, there’s around about 3 million downloads of my podcast. So if you are shy or you’re thinking a podcast is not for you, I would challenge you and say, you know what? It doesn’t even matter. Someone out there will find your information useful if you structure it correctly and if you create a good podcast. Now, I know there’s people out there with podcasts numbering in the tens of millions, fifty million downloads, and that is great. I certainly haven’t reached those levels. And the good news is, you don’t have to to make good money from your podcast. It’s still pretty much my prime traffic source since I’ve been doing this in 2009, Episode Number One, right through to now. In that time, I’ve had multiple podcast shows. It was even called something different back then, it was Internet Marketing Speed. Then it changed to SuperFastBusiness. It’s had a few different logos. I’ve added and subtracted extra podcasts. I’ve had Think Act Get, Freedom Ocean, Sales Marketing Profit and Kicking Back as well as my SuperFastBusiness podcast. So there was actually five running at one point. But for whatever reason, we’re back to this prime podcast of SuperFastBusiness. So if you’re not sure about podcasting, I would say that it has been really good for me. At last count, I’m up to about seven hundred ninety-three episodes, and they’re not that hard to do compared to other activities. See, I don’t like to write, I don’t type, but I can talk and I’m happy to record it, even if I don’t like the sound of my own voice. And so far, I’ve sold more than 10 million dollars’ worth of my own products and countless millions of dollars’ worth of other people’s products in various affiliations. So I just like this saying: do more of what works. I have a look on to the iTunes marketplace and I can see now which episodes resonate well. So as you’re listening to this, I know that I’m tuning into topics that are most interesting to most of the people who I serve, based on the feedback that I get from each of the episodes published. You can also get analytics behind the scenes from places like Blubrry stats and now Apple actually released statistics. It’s worth having a look to see how much of your episodes people actually listen to. I know that when I get guests who are a little bit famous or have topics that are very interesting to my customers, the popularity bar graph maxes out. And that’s what I focus on, doing more of those. I’ve also had some really crazy podcasts where my guests forgot that the podcast was on. One of the most downloaded podcast episodes that I’ve ever done, in fact the most downloaded for this SuperFastBusiness blog is actually an episode I did with Noah Kagan, and he was eating his breakfast as we started recording. And it was quite an interesting episode, but it had the most downloads so far. And it very easily could have been put off because maybe we would have rescheduled or he’d forgotten about it. But you can hear, if you listen back to the episode, and we’ll link to it from the show notes, that we just rolled on with it. And sometimes your best moments come from these crazy things that happen that are not scheduled. But I think as a podcast creator, the thing I want to answer the most is, what is that burning question going on in the mind of my prospect? What would they like me to produce on this podcast? What questions are going on there that need answering? And I’m going to focus a fair bit in this particular episode about suggested interview questions, because it’s quite easy, even if you’re not an expert, to bring in a guest who is, and to ask them some questions and record that. So the interview style format is what I’m going to focus on in this training. But in saying that, some of my best podcasts have been just me reading a researched material that my team have put together, or repurposing something like the live monthly training that I did for SuperFastBusiness membership into a podcast episode, so that I can give a great demonstration or sample to my podcast listeners and encourage them to come along and join SuperFastBusiness membership. One of the easiest episodes that I’ve ever done and one of the most shared is Episode 442, which was How To Find Your Reason For Being – Delving Into Ikigai. And at that time, I’d only just heard about that concept from a friend of mine, his name is Jiro. And I looked up the concept and did some research on it and I thought, this is really on target for my audience, because it’s on target for me. And it was a better version of what I’ve seen before called The Hedgehog Principle, From Good To Great, by Jim Collins. So I asked my team to go and research it and they produced this well-researched document and I read it out as a podcast. And it’s been shared plenty of times on the internet. It still drives us lots of organic search traffic, and I know that it produces members of SuperFastBusiness membership. So it’s been a good piece of content. Now the reaction that I’m looking for when I interview my guests is simply this: That’s a really good question. If I get that response, then I know that I’ve hit the mark. So what I did is I went back through all of my podcasts and I searched for that phrase, because we transcribe most of them. It was a little bit of digging, but I found them, and I’m going to share with you the top 17 questions that caused that reaction. So here we go. Remember, you can download this resource from the Episode 584. Number one: Is there any situation where you would not use _____ (and I would insert the technique or specialty that my guest is recognized for). So if I was interviewing a LinkedIn expert, I might say, is there any situation where you would not use LinkedIn? And this is a really good question because it forces my guests to counter some of the objections that they might get on a daily basis. And here’s the thing, sometimes my guests are a little bit confused or a little bit pressured by those questions, but these often produce the best answers. And if they answer them well, then they truly are an expert and they have quite a degree of experience and it will show through in the interview. And number two is a similar one on that. It’s: Is ______ (and I insert the guest’s expertise) only for some people or can anyone do it? So if I was interviewing an e-commerce expert, I might say, ‘Is an e-commerce store only for some people, or can anyone do it?’ And this one helps people realize where they’re at in relation to this, if it’s relevant for them. Third question: How do you know what to do next? This one helps people work out the step-by-step process involved in whatever I’m talking about. Question number four: How has the business changed as it’s grown? This is a great question for me, because I coach people who are experiencing growing pains. And my guests have invariably gone from small to big, and the steps they’ve gone through usually fall into the same sort of categories on topics that I help, and it’s fascinating for me to see how they’ve applied these tactics. Five: How do you know if the number you focus on is the right number? So this is a metric question, the dashboard question. I might set this up by, What sort of things do you track in your business? And then I ask, How do you know that’s the right number? And it’s really good to get some different answers on that. Six: What sort of success rate have you seen after ______ (and then I’d insert an event happening)? It could be, after you ran your first live event, or after you switched on your Facebook campaign. I like to get a before and after contrast to highlight the tactic. Question seven: What is the motivation for ______? And this is some kind of action. What is the motivation for putting out a book? Question number eight: What things do you see people do that you wish you could tap them on the shoulder and say, “Hey, there’s a better way”? This one really lends itself to that Peter Thiel question, What do you know, what truth do you know that the rest of the market doesn’t? This is a great angle or positioning statement for my expert. Nine: What rookie mistakes or common problems do you see over and over again? This one helps an audience member relate to what the expert is teaching, because they can recognize these mistakes and then they understand that the expert can help them solve it. Ten: Why do you feel that such and such is important? Why is it worthy of anyone’s time? So as you’ll find out in my podcast interview worksheet, the why is one of the prompts in my worksheet and I have to connect the why with my audience. If the audience doesn’t know why they’re prepared to listen to this podcast, then it’s not worthwhile. So if you think about when I started this particular episode, I gave a little introduction as to why I think podcasts have helped me and how they might help you too. Question number 11: What are you doing as your next step? Where do you see it going from here? This is like, we’ve gotten so far in the journey, but what’s the next step? This one went really well when I was interviewing the founder of Foundr, Nathan Chan. And it was a good set up because I had actually advised Nathan to set up a membership, which he did for spectacular success, and he was able to credit me with that, which was important on my own show and it was good recognition. Number 12: Do you think that you need to have X before you do Y? So this one is really a sequencing question. It’s like, which step comes first? You could also ask that. That might even be a more elegant way to say it. Question 13: What sort of things have you seen people do that surprised you? This is a good one because surprise is a great emotion. And often you get fantastic stories from your guests when they share things that surprise them, because if it surprised them and they’re the expert, sometimes it might surprise you. Fourteen: What was the most interesting thing you’ve seen? So this is a different emotion. Instead of surprise, this is now interest. And people might be motivated by different things, so their interest might be piqued by different things. Fifteen: How do we achieve this? What are some of the parts that are required and how do we actually set them up for success? So this now relates it back to my listener. This is like, OK, it’s fine for you, you’ve reached all of this success and expertise, but how do we get there? What are the steps? Sixteen: What kind of business or customer do you find is coming to you asking for help? This is a fantastic question for my expert to identify who their target audience is and to confirm that as a hit, so that if someone’s listening to my podcast and they want to follow up the guest, they can. And typically when someone comes on my show, they are going to experience a flurry of activity to whatever resource they mention, because that’s part of the give and take of a podcast interview. The guest comes and shares great information, and they get to put a link to somewhere where they can drive my audience, and that’s an exchange. So this is a great path to heat up that exchange. Seventeen: Where do you learn this stuff from? How did the experts learn this stuff before the rest of us? And I genuinely was interested in that. This question I would classify as a vertical integration question. I actually get asked that question a fair bit, too. Where do I learn from? What books do I like? And what people are doing, whether they state this or not, is they’re trying to jump ahead of me and go straight to the source. And that’s admirable and it’s great even though it’s not going to happen, and that’s usually because I’ve had to have all those years of experience working different jobs to get the knowledge that I’ve gotten. I’ve read thousands of books and traveled overseas for a decade to conferences and built up my Rolodex. So a lot of the things that I help my customers with, they can’t get directly but they can get it directly from me. So that’s my answer, in case anyone thinking of asking. So what I want to share now is the process for an interview, and this is stunningly simple. And I’ve put together a podcast interview worksheet that you can download, and you could fill this out to do the prep for an interview. There’s also the hook. Why is this show interesting? What are we going to call this episode to make it compelling for our audience? And it’s good if you can identify the hook before you do the podcast. And if you can’t, then come up with it afterwards, which I’ve had to do on a few occasions. And luckily for me, mostly those occasions are where I’m talking to someone relating to copywriting, and they can help me out with the hook. So if your guest is a copywriter, enlist them. Then down the left hand column, I have, why, what, how, what if and actions. Now this is more or less the framework called 4mat. Why helps people understand why this is important to them. What clearly defines what the topic is. And how is helpful for the people who want to know how it all works. And what if covers off the objections. This is where you can answer the objections. What if I don’t have any budget? What if I don’t have any time? What if I don’t have certain skills? Can I still do it? And then actions is the prescription. What would you have people do after they listen to the show? Then there’s on the right hand column, notes. This is where I write notes during the podcast, and I’ve found it very handy to have a pen and paper. I do write notes, and that helps me summarize the episode at the end or as we’re going through. It also helps me take a picture of it to send to my team if there’s any resources that we need to include in the show notes. And the final thing on the bottom right is call to action. That’s where I ask people to do something. Typically, it will be to join SuperFastBusiness membership. It might be to go and check out a resource our guest has mentioned. It could be to share this episode with a friend if you found great value in it, or it might be to put a comment where you find this episode, if it’s interactive. So I’ve put this podcast interview worksheet right near this episode for you. If you’re also doing a book review, then I would encourage you to read the book. It’s quite surprising, but sometimes people interview me about my book and it’s quite obvious they haven’t read it, because they’re not asking any questions that relate to the book itself. And if I interview someone about their book, I am most definitely going to read the book. Usually you can get an indication in Kindle how long it will take to read the book, and my hot tip is if you are absolutely pressed, you could log in to the popular highlights from a book in Kindle and see what other people highlighted. And you’ll notice that most of the highlights come from the first few chapters, and that’s simply because people don’t read the whole book, so you’ll get a lot of highlights in the first few chapters. Go and see what the popular highlights were, because that is a market-validated test of what things in that book are most interesting to most people. And also, I’d suggest you skim the chapter titles and go and read a little bit of each of the chapters so that you can make some notes and ask useful questions. If you want an example of this, I did a great podcast with Doberman Dan about his book, and I was able to reference certain things that he said in the book that made great discussion points. I also read Vishen Lakhiani’s book, and he was impressed by that, because I think he’s also experienced interviews where people clearly haven’t read the book. Now a couple of other little additional notes. What if you happen to disagree with something someone says on your podcast? Well, I think it’s quite fun to highlight that and to put forward your opposing point of view. And certainly if someone says something that you do not endorse, you should actually state that. I had somebody endorse a tactic that I would never recommend in one of the podcasts, so I clearly distanced myself from that and said I do not endorse that tactic. It doesn’t sit well with me. And that way, people understand my values and they’re not taking this podcast as an endorsement of that tactic. Sometimes, you get the absolute best answers, so if you’re drowning, if you’re not sure what to say, you could pop out a question like, What advice would you have for someone who has this particular problem? And describe your typical customer or your listener and let the expert prescribe an answer. And then just think, what would your customer want you to ask next? 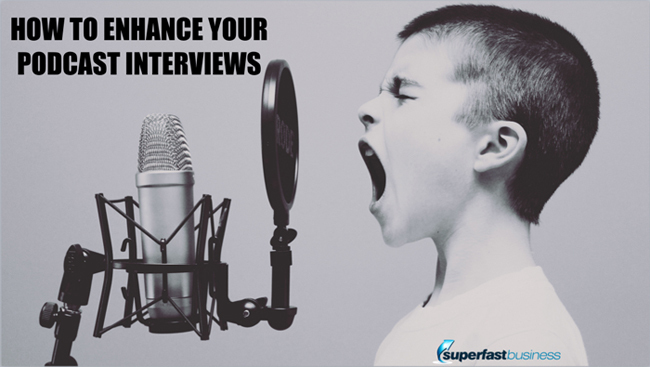 Because whatever the person says, you might be onto the next question in your mind or looking at a checklist, but that’s not going to get you the greatest interview. So I like the pull the handkerchief technique, where you ask a question and you get an answer, so then you can ask another question based on the answer, and then you get more answers, and then you get another question based on that answer, and then you get more answers and you get more questions around that. So it’s like the magician’s handkerchief, it just keeps coming and coming. And some of the very best podcasts that I’ve done are where I’ve been able to just keep drawing out my guests, question after question, on something they said that wasn’t planned for or scheduled. Now, the last part of this training is, as a guest, if you were going to be a guest on someone’s show, here are a couple of things that you should do. Firstly, you want to craft your own bio. Make sure that you are in control of how people introduce you. Secondly, provide an image, a quality image of you. Otherwise, people tend to go on to Google image search, find the worst possible image of you from seven years ago, and post that on their post, as if it’s fresh. You should be in control of your own image, and that’s really as simple as getting a professional photographer to come around for a couple of hours and take some pictures of you with nice lighting equipment and a different wardrobe. And the third piece is the audience brief. You have to know about the audience who you are talking to so that you can be relevant for them and deliver a high-value piece of content. So there you go. These are my tips for how to enhance your podcast interviews. It’s really the lessons that I’ve learned after around three million downloads and paying attention to what has worked for me. I encourage you to try podcasting. If you need help with it, we have an entire community of people who are doing podcasts inside SuperFastBusiness membership. They’ll also help you share your podcast and listen to it. And we have some fantastic conversations, and I’m willing to personally coach you with your business inside the community. That’s where you can get real value. If you liked this training, this is just a sample of the kind of training that I put inside the membership each month. I’ve got some really good training, such as how to sell your online membership subscription on autopilot without having to pick up the phone. I’ve also done an entire training on how to keep customers and reduce churn, which is really the death knell for a subscription membership. And my newest members who have come in and consumed those trainings have said that that alone was worth the value of a year’s membership, because they were about to make the same mistakes that almost everyone makes when they’re setting up their podcast or their subscription membership. So I’m looking forward to helping you. I am James Schramko. You’ve been listening to Episode 584 – How To Enhance Your Podcast Interviews. If you love this episode, please share it or leave me a rating on iTunes and I’ll see you inside SuperFastBusiness membership.